If you want to enjoy more natural light in your home, but find skylights too big, expensive or hard to maintain, solar tubes offer a simple alternative. Also known as tubular skylights or sun tunnels, solar tubes give you an unobtrusive way to brighten the darker areas of your home with soft, natural light. The standard solar tube is a tube of polished sheet metal installed in the roof to channel sunlight into the house’s interior. They’re most commonly available in 10- and 14-inch-diameter sizes, which fit between standard 16-inch roof joists. On the roof end of the tube is a weather-resistant acrylic cap. On the ceiling side is a round window-like opening fit with a diffuser that helps distribute the light evenly. With solar tubes, you can light your home for free without the expense of skylight installation or the need to alter the look of your rooms. Free lighting – On a sunny day, one 10-inch solar tube gives you around the same amount of light as three 100-watt bulbs. That’s enough to illuminate a 200 sq. ft. room well enough for office work or light a 300 sq. ft. room enough for less visual activities such as taking a shower or folding the laundry. With this much light, you’ll no longer have to use an electric light on sunny or even moderately cloudy days. You’ll enjoy extra convenience while saving money. If you need light at night, too, choose a solar tube model that includes an electric light. Design flexibility – Given their size, skylights are hard to miss when you walk into a room. Solar tubes, on the other hand, are subtle design elements that add light without calling attention to themselves. If you want to bring more light into your living room or bedroom without altering the room’s architecture, solar tubes let you do it. They also fit into smaller spaces than traditional skylights, making them a practical way to brighten up a small, dim hallway or pantry. Lower risk of leaks – Traditional skylights are well known for their tendency to leak. A major reason for this is the way they collect debris, such as leaves, which prevents rainfall and snow melt from draining off the roof. The built up water then finds its way under the roofing material and then to your ceiling. Solar tubes are less likely to leak because their small, relatively flat dome allows water to drain around them. Budget-friendly installation – Solar tubes might look like a luxury feature, but they don’t require a major investment. The tubes themselves cost less than skylights, and they’re also less expensive to have installed because they don’t require any changes to your drywall or framing. Professional installation costs less than $1000 in most parts of the country. To save more, you can install your solar tubes yourself with a kit that costs less than $500. That said, in certain more complicated cases where installation requires fitting the tube around wiring, pipes or air ducts, you’ll get better results by hiring a professional. Solar tubes give you fewer options for controlling the light entering the room, and their small size means they do little to enhance your home’s architecture. Fewer options for control – Skylights give you more control over the quality of light you let in. Skylight shades work just like window shades, while the variety of skylight diffusers on the market gives you plenty of options for distributing the light in the room. You can also add film to reduce UV light that can fade your rugs and furniture. Vented skylights even let you get some fresh air with your sunlight just by opening the skylight as you would an awning window. With solar tubes, shades and venting aren’t really options. While you can use diffusers and window film, you’ll have a more limited selection compared to what’s available for skylights. Little design improvement – Skylights are an architectural design feature unto themselves, making the room appear larger and airier, and giving you an ever-changing view of the passing clouds. They add both an ambiance of luxury and a feeling of connection to nature. Most solar tubes, however, are too small to affect the room’s appearance beyond letting in light and they don’t let you see much of anything outdoors. Not equally suited to every home – The type of roof you have might make it impractical to install solar tubes. 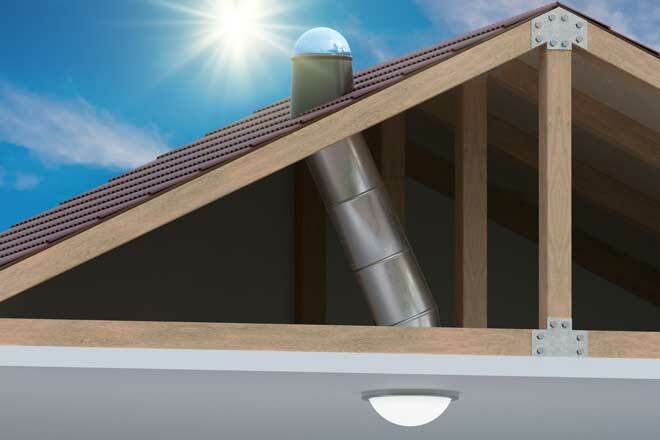 Most solar tubes are designed for roofs with a slope between 15 and 60 degrees. If you have a flat room, you’ll need to look for tubular skylight models specifically designed for this type of roof. On a steeply pitched roof, such as an A-frame, installation might not be possible at all. Most DIY solar tube kits are designed for roofs with asphalt or wood shingles. If you have tiles or a metal roof, you’ll need an adapter. In high-humidity climates, condensation on the inside of the tube is a common problem. You can minimize this by wrapping the tube in R-15 batt insulation before you install it. If your home could use a little more daylight, particularly in the smaller spaces, but you don’t want to spend a lot or change the overall look of your rooms, solar tubes are a practical solution. On the other hand, if you want to make a major impact on a room’s appearance and you’re willing to pay for it, you might want to stick with traditional skylights.